Spring is just around the corner, and soon the air will be filled with the intoxicating scent of grilled meats. While the days may be getting longer, some of us just cannot wait to fire up the grill. If you find yourself hovering over the grill, trying to coax one last burger out of the grill before losing the light, you may want to consider adding some of your own light. 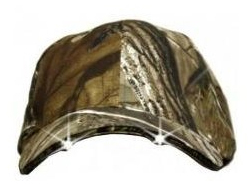 The Camouflage Lighted Hat W/ 2 LED Lights is a solution for all you nighttime grillers. Attached to the brim are two LED light that are focused to shine in front of you. No more guessing when its time to flip that burger. As an added benefit, consider the fact that it will be dark out when using this, so nobody will see you wearing it.